The men’s tennis team dropped six of its seven matches but did manage to win two of three in doubles. The women were shut out, but Australian freshman May Johnson made her U.S. debut. 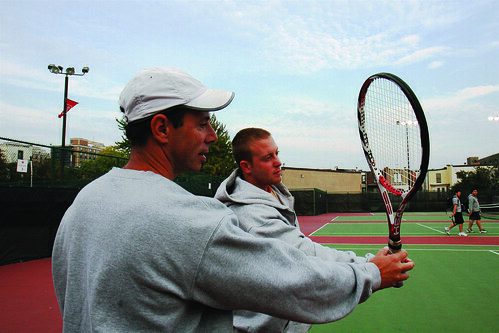 TTN File Photo Men’s and women’s tennis coach Steve Mauro shows his son, Kurt, a sophomore, a tennis move. Mauro’s men’s team will depend on the Rams brothers, while the women’s team will look to Australian freshman May Johnson. The men’s and women’s tennis teams both struggled in their season openers Saturday night at Dartmouth. The men lost six matches to one. They did manage to take two out of three in the doubles matches, however. The doubles wins came from sophomore Filip and freshman Kacper Rams, who soundly defeated the team of senior Dan Freeman and sophomore Michael Laser, 8-1. Sophomore Dmitry Vizhunov and sophomore Mansur Gishkaev supplied the other men’s doubles victory, as they defeated the Dartmouth team of freshmen Xander Centanari and Mike Jacobs, 8-3. The Rams brothers have been the strength of the men’s team throughout the fall season, which culminated with their appearance in the Intercollegiate Tennis Association tournament last November. There, the Rams brothers lost in the second round of doubles competition to a pair from the University of Virginia, the top team in the tournament. In singles play, Kacper lost his opening-round matchup, while Filip had a first-round bye. Filip won his second-round matchup before falling in the third round. Both brothers lost their singles matches Saturday. Filip fell to Freeman, 6-7 (7), 6-4, 10-6, in a closely contested matchup, and Kacper lost, 6-2, 6-4, to junior Curtis Roby. “We came into this match and expected a different outcome,” Mauro said. “We didn’t play nearly as well as we are capable of. Maybe it’s the lag of not playing for a while. The women’s team fell to Dartmouth, too. They were shut out. On the bright side, Australian freshman May Johnson made her debut. Johnson was named one of Australia’s Top 20 female tennis players in the 18-and-under category. She lost her first match in the United States, 4-6, 6-2, 10-7. Despite the opening struggles for both teams, Mauro said he isn’t about to lower his expectations. Both teams will be back in action next week. The women take on Southern New Hampshire and Princeton, while the men will battle Penn. The Owls swept Villanova 5-0 on Friday at the Legacy Tennis Center, but lost to Penn 7-0 on Saturday.